Damn, it's definitely early blight and it has spread to the other 2 tomato plants in the GrowBox container. Dark lesions with a bulls-eye pattern of concentric rings (click on the photo for a closer look) are the classic symptoms of early blight. 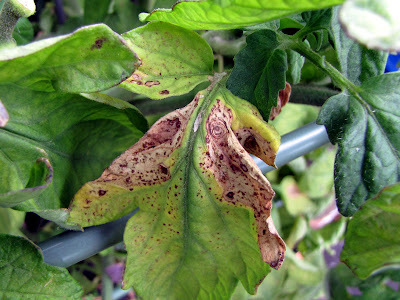 Early blight produces a wide range of symptoms at all stages of plant growth. It can cause damping-off, collar rot, stem cankers, leaf blight, and fruit rot. The classic symptoms occur on the leaves where circular lesions up to 1/2" in diameter are produced. Within these lesions dark, concentric circles can be seen. The leaf blight phase usually begins on the lower, older leaves and progresses up the plant. Infected leaves eventually wither, die, and fall from the plant. Ever since the cherry tomato plant was infected I've been watching these vegetable plants like a hawk, so I noticed the signs very early on, and have been treating it with weekly applications of organic fungicide. As a result, the infection hasn't spread that far up the plants and tomato production hasn't been affected. Hopefully all of them will hold out until the end of the season. These bulls-eye lesions didn't appear on the cherry tomato leaves. Maybe because the leaves were too small? Anyway, it was nice to be able to figure what was going on. Ouch! I hope it isn't too bad and you manage to get a decent harvest. 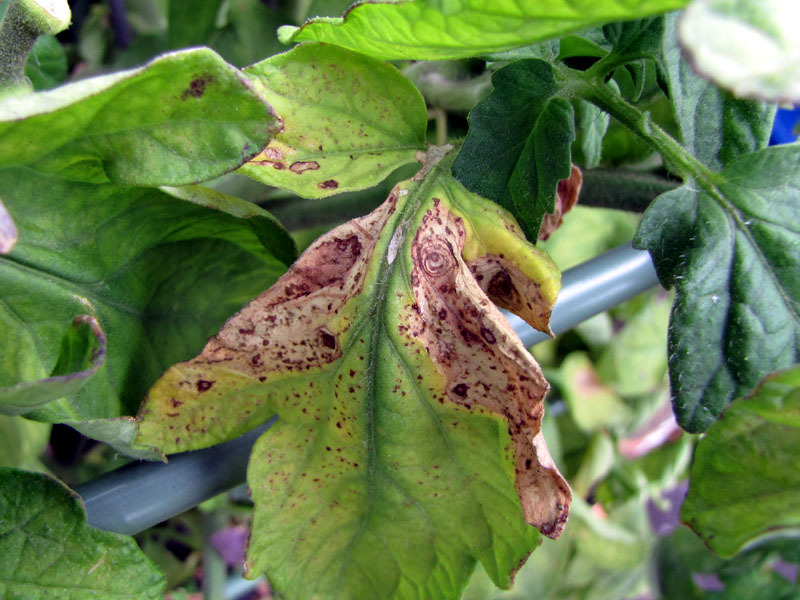 Ugh, sorry to read that you have blight on your plants. What can you do? Sh*t happens. I garden for pleasure, not for a living, so if something fails its not the end of the world. I think we learn more from failure than success so while I'll probably lose out on produce I'll still gain in knowledge. There's always next year!